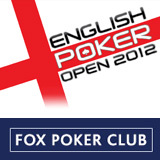 Online satelites for The English Poker Open, being held from 18-21 September at the Fox Poker Club, London, start today. Registration for the tournament is also now open. Sponsored by RakeTheRake this esteemed live tournament is offering players £250,000 guaranteed. The EPO qualifier schedule commences today with online satellites from Genting Poker. The series continues with further online qualifiers from Cake Poker, Colt Poker, Euro Club Poker, Intertops Poker, Lock Poker and Power Poker. There will also be live EPO qualifiers available at the Fox Poker club, running from Monday 10 September to Tuesday 18 September for its Tier 2 Last Chance Qualifier. Its sister club The Palm Beach in Mayfair, London, will host live qualifiers from Monday 10 September until Monday 17 September inclusive and there’s a further live qualifier at Genting Casino Cromwell Mint on Thursday 13 September. Check englishpokeropen.com for latest details. Befitting its reputation for a high calibre poker field, the English Poker Open has one of the biggest buy-ins at a UK tournament in 2012. As such, it is attracting interest from pro players around the globe. To register for a seat, players should contact the Fox Poker Club by emailing cashier@foxpokerclub.com, or by calling the club on +442074943020. Watch www.EnglishPokerOpen.com and LIKE 'English Poker Open' on Facebook, or follow ‘EPOlive’ on Twitter for further announcements. The EPO is sponsored by RakeTheRake.com – poker cashback, win or lose.